I am working on something and I wanted to make a leather handle for it. I did a little bit of leather work last year, but there was till so much to learn. I am not an expert at leather, quick the beginner, actually, but that means you can learn along side me. 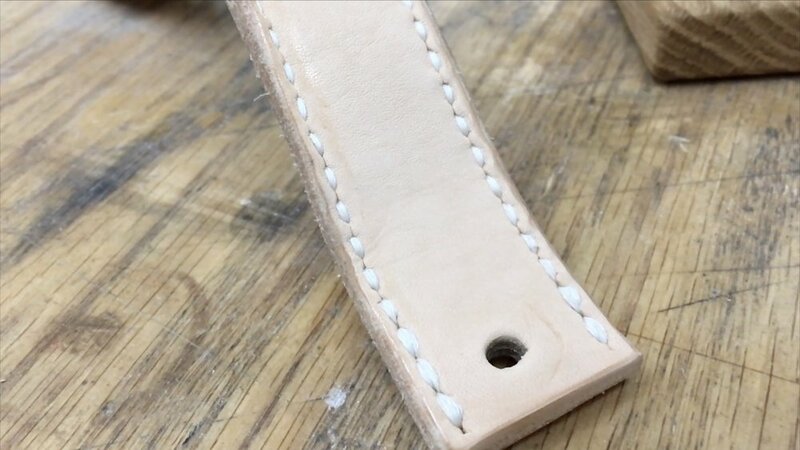 I'll share some of the tips I've picked up about saddle stitching, a common leather working stitch, as well as edge burnishing leather, punching the holes and more! There are many places from which you can source leather, notwithstanding online sources. I've ordered from quite a few, so I'll point out some things about them here. Something worth noting; I am not trying to disparage any company. I am merely giving facts and observations as I have does some shopping for leather. I've ordered a little bit of leather on Amazon. I found that the prices were pretty high. Years ago, I ordered a thick piece of leather to use as a strop for my sharpening process, and one small piece that was probably about 8" wide by about 12" was about $15. Tandy Leather, in my research, was considerably higher than some of the other online options I will tell you about coming up. Now, maybe the leather is different quality, but from what I saw, comparing apples to apples, I was able to save over $100 on a single side of leather (usually between 20sqft and 22 sqft for cow) by using a company other than Tandy. I found Maverick Leather company on Instagram and started interacting with them. they post there frequently and put up some specials for their followers. You can also get on their email list, and they tell you about deals and closeouts they have. It was good stuff, and I think I got that entire side for about $60 plus shipping. Acadia Leather is another company I found via Instagram. They also post a lot, and run specials via their Instagram page and website. They have free shipping to the lower 48 states, so that has been a pretty big deal on the few sides I've bought from them. I have probably purchased a total of 3 sides or leather from Acadia. I typically watch for a special they run, and I pick up an entire side for as low as $35 shipped to my door. That's a great deal! Check with them first if you're wanting to get some leather. I started off by cutting a small piece off of the side of leather. I needed a few strips, so I knew I would be able to get all of them out of this small piece. I didn't even both with using a straight edge to cut it, since it was just a rough cut and I would be more precise with my actual strips. I used a ruler to get one straight side on the rough piece, and then measured over 1 1/4" inch. Also, at the bottom of the piece, I marked out the same measurement. Then, I put my ruler on those marks and cut the leather. I repeated these steps to get two identical strips of leather. To punch the holes, and for the holes to line up, I used a spring clamp to hold the ends of the pieces. Then, I used a compass to score a line where my holes needed to be punched, evenly spaced from each edge. Going through two pieces of pretty thick leather, I had a little problem with the leather piece deforming. This caused a little curve to the pieces, and made my holes on the back piece to not be as straight as I would have liked. I guess I could have glued the two pieces together with contact cement first, but I really didn't want to. I started at one end and used a punching tool (some call them pricking irons) that had 4 prongs. I have one with a few more holes, but I didn't have many to punch, so this worked just fine. I put them on the line I had scored and hammered until it went through both pieces. NOTE: be sure to put a spoil board or something underneath that it won't hurt to hammer into. I've seen a lot of people use those polypropylene cutting boards underneath. 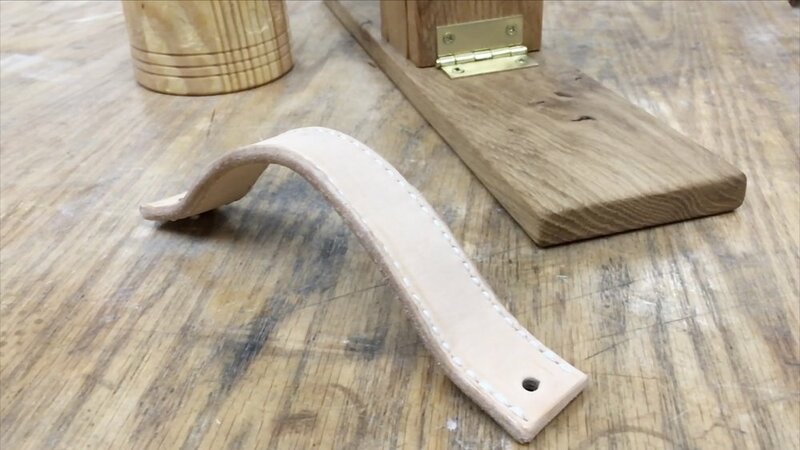 When I would get the punching tool out of the leather, and I was ready to make the next punch, I would put at least one of the tool's prongs into a previously punched hole. That way, I was referencing the spacing and it would be more uniform. HOW MUCH THREAD SHOULD YOU USE? You're not alone if you wonder how much thread to put on your needle for a given task. All of my research said to do something like 3-4.5x the length of the piece you will be stitching. I don't actually measure this out, but rather just hold my thread up to gauge the length, fold it over to double it, and do that two more times. The type of stitch I'll be talking about is a saddle stitch. There are other stitches in leather, but I have heard the most about saddle stitching. It is supposed to be quite a strong stitch, but it does take a while to accomplish. To start, you need two needles to do a saddle stitch. Put the thread through the eye of one needle, and pull it through a few inches. There are some differing opinions about this part, but I'll tell you what I did (based on some things I read) and it seemed to work. Take the end of the needle and poke it through the small piece of thread that you just pulled through the eye. (these threads are braided, so they have multiple individual threads together to make one thread. )Then, take the open end of that thread, and pull it through that loop you just made. Form a small knot as you pull it up pretty tight against the eye of the needle. This will help you be able to pull and get your stitching tight as you go, without your needle falling off of the end of the needle. Repeat this step on the other end of the thread, so you have a needle on each end. You can't read much about leather working and not hear about the saddle stitch...multiple times. It is a very simple, but very strong stitch that is often used in leather working. 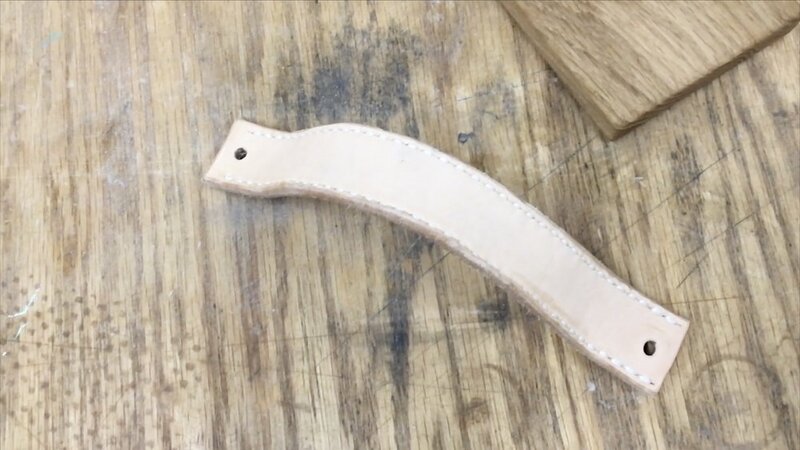 How do you saddle stitch leather? Put one needle through, and grab both needles and pull upward until you have an even amount of thread on both sides. Then, start about 2 stitch holes forward from where the end of your row is. This is called a back stitch. The reason is you want to do a back stitch to lock in your stitching. Then, insert one end of your thread (with a needle on both ends, remember?) and pull upward with both ends until they are even. Choose which side will be your front side and keep that in mind. That's important later since you will be tying things off and you want things to look great on the front. Put one of the needles through the next hole back from the one the thread is in now, and put it through both pieces of leather. For this example, I'm going to say I'm starting at my right hand, and pushing the needle through to the left side. The other needle is in my left hand, between my thumb and forefinger. Bring the needle in the left hand underneath the other needle, and perpendicular to the one coming through the leather, forming a cross. Pull the first needle through the work piece, rotate 90 degrees clockwise, and put the second needle (the one that has been in the left hand) back through the same hole. Grab that needle with your right hand, and pull it all the way through. Once it is all of the way through, grab both ends of the thread and pull the stitching tight. You want it snug, but don't pull so tight that you deform the leather. Keep doing this all the way down until you reach the end of your row. Once you reach the end, repeat the above steps to create a back stitch, going back a couple of holes. Then, take the needle that's on the "finished" side, and put it back through to the "back" side. that way, you don't have loose threads showing from the face of your work piece. At this point, you're done with the thread for this row. I actually tied a couple of small knots on the back side, but that's not completely necessary since I did the back stitch. For this particular handle and project, I just repeated these same steps for the other row that needed stitching. After cleaning up the short ends a bit (cutting them square) and using an edge beveler tool to kind of round over the edge, it was time to do some edge treatment. Some people sand the edges of their projects, but some don't. I think I want to work on my burnishing techniques so that I don't have to do as much sanding. A friend who does a lot more leather working than I do told me that he doesn't even sand the edges on most projects. There are a number of ways to burnish the edges of leather. I've experimented with a couple of them. I have used glycerin saddle soap that I rub on after wetting the edge. That has worked ok for the few things I've done. 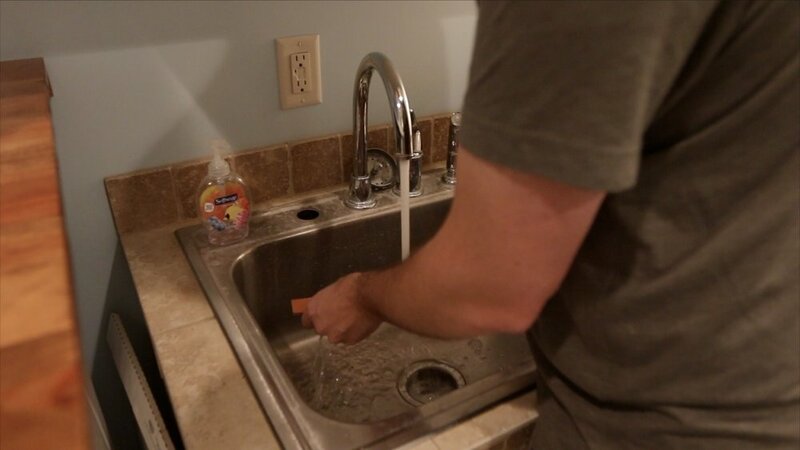 I also tried just using water, and then the slicker tool. That seemed to work just as well. I've heard that using some wax can also help get a great result. The way burnishing the edge works is the friction from rubbing a slicker tool back and forth, and the water or whatever other medium, causes some head to build up. This allows the ends to get a nice, slick look and feel. I decided I wanted to wet form this leather handle into an arched shape. I took the piece to the sink and ran some warm water over it. Then, I took it back out to the shop and used a cup to kind of wrap it around. I clamped it so it could just sit like that overnight. It worked really well. The curve relaxed a bit from how I had it set, but that's what I wanted and was counting on. I had actually burnished the edge before doing the wet forming, but that caused the edge to not look slick again, so I did it again after I removed it from the clamp. Well, that's pretty much it for this project. It was fun to experiment with a few different things and processes. It was very cool to be working with a tool that I made (stitching pony.) I'm looking forward to incorporating more leather into future projects. 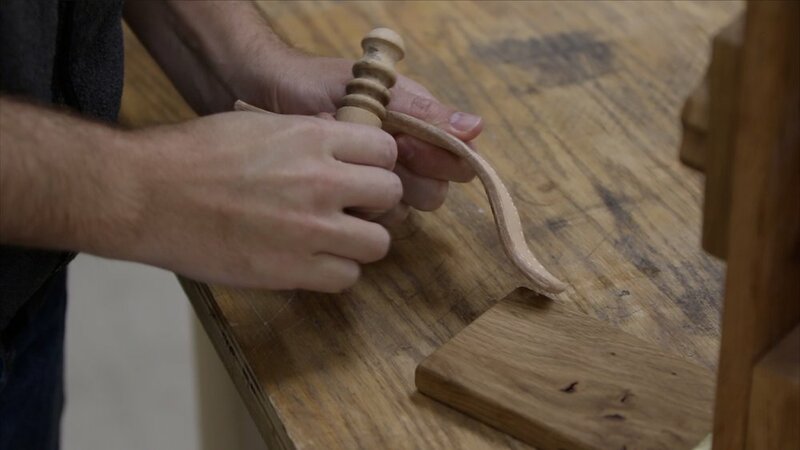 Remember, the handle I made and talked about in this post is for an upcoming project that you will NOT want to miss! (You can get a sneak peek of this project at the end of my video, if you’re not already seen it.) Stay tuned to see that very soon, and thanks again for following along! One more final note…I do a podcast called We Built A Thing. 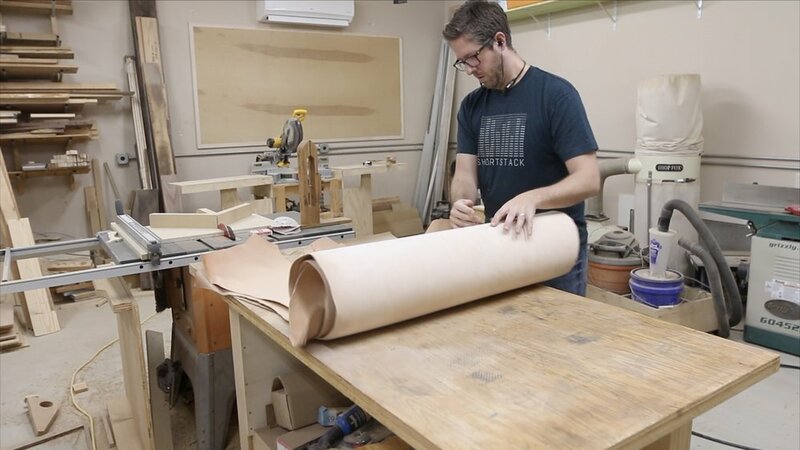 It’s a maker-related podcast I do with a couple of friends, Mark and Drew, and we discuss making things, producing content for YouTube, Instructables, Instagram, etc and about being dads. Find it in your favorite podcast app!